It was my pleasure to fly to Wellington to present Prof Vicky Mabin with her Hans Daellenbach Prize. 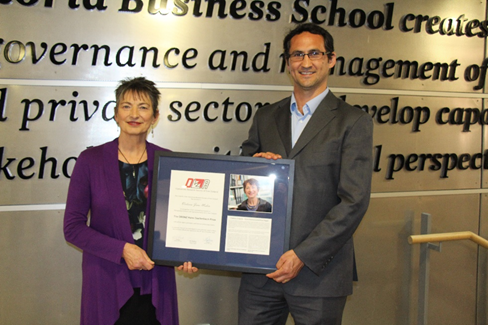 A/Prof Bob Cavana organised an excellent event at which Vicky’s colleagues and students, alongside the Victoria University of Wellington Provost Professor Wendy Larner and local ORSNZ members, honoured Vicky’s distinguished and pioneering career. 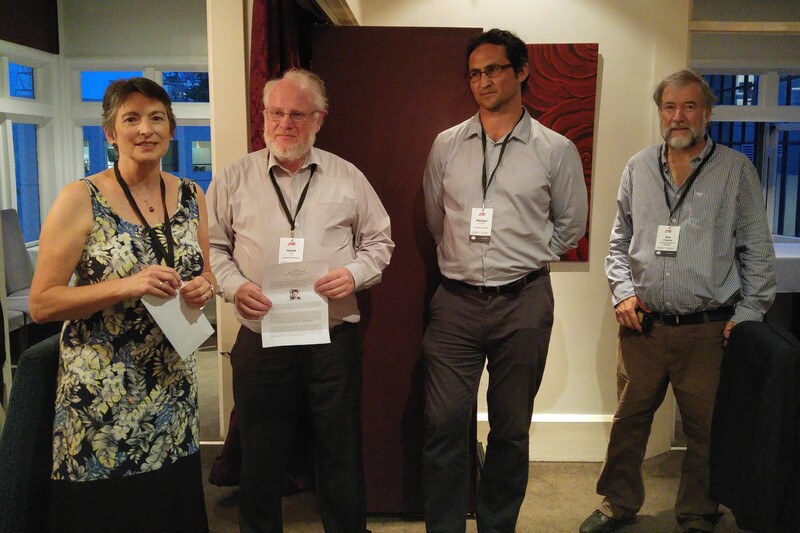 Special thanks to Bob, Tony Downward (who was responsible for the framed prize in the photos), Andrea Raith, Rosie Read (the ORSNZ Wellington Region contact) and other members of the prize panel (Grant Read and Golbon Zakeri). My initial impression of Vicky was of a (slightly intimidating) leader of OR in New Zealand. Any discussion of OR in New Zealand at Auckland would inevitably end with “we should talk to Grant (Read at Canterbury), Vicky (at VUW), and Les (Foulds at Waikato)”. I was fortunate at the ORSNZ conference in Christchurch in 2015 to get stuck looking for a taxi with Vicky and Sarah Marshall. In the ensuing conversation I got to know Vicky a little and gained an increased understanding and appreciation of her work. Since then I have enjoyed our discussions on OR and the Theory of Constraints and my experience in OR consultancy over the past 5+ years has convinced me that Vicky’s “soft OR” has a vital part to play if we, as OR practitioners, are successful in embedding best-practice decision making in organisations throughout NZ and worldwide. Vicky’s colleagues and students were generous in their praise and admiration of Vicky, who responded with an engaging, illuminating acceptance speech (that only increased my interest in collecting stories about the history of the ORSNZ!). Congratulations and well done Prof Vicky Mabin, Hans Daellenbach Prize recipient for 2017!